Kitchen inspection manual is not a replacement for an inspection performed by a professionally trained and licensed home inspector. The following kitchen inspection guidelines can be used by a home inspector to establish routine procedures while performing a general home kitchen inspection. Every home owner/ seller / buyer can also follow this kitchen inspection manual to determine if his kitchen conforms to the residential construction industry standards or / and if the contractor did his job right on a brand new kitchen. Keep in mind that building codes are updated / changed periodically and requirements my slightly vary between jurisdictions. Don’t hesitate to ask me questions and always verify if particular requirement has been adopted and is being enforced in your area by contacting your local building department. Some jurisdictions may not adopt various building codes or their portions even for a few years (or sometimes never) after they’ve been issued. Kitchen inspection and my other inspection manuals are based on the most widely adopted in United States residential building code: 2009 IRC (International Residential Code), and on the oldest and most widely used electrical code: 2008 NEC (National Electrical Code). Plumbing and HVAC uniform codes which are used in various parts of US have been utilized as well. Check kitchen GFCI post for more ONLY electrical details of the kitchen inspection. 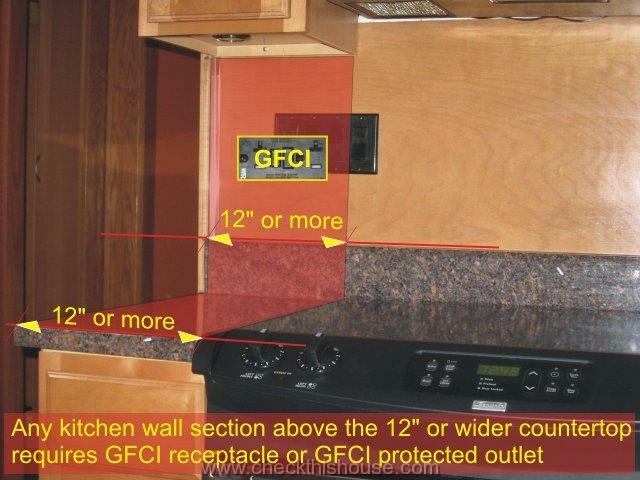 All kitchen countertop receptacles must be GFCI protected and 20 amps rated. There might be 2 GFCI receptacles (each on one of those two circuit breakers), and additional outlets connected to those GFCI receptacles (protected by them). Even if your kitchen has only 2 countertop outlets, each one must be on a dedicated circuit. Test every single outlet with a GFCI circuit tester or use any cord & plug lamp – make sure that it is ON when plugged into the tested receptacle and it goes / stays OFF after you push and release TEST button. Don’t forget regular GFCI outlet maintenance and testing, your life might depend on it. There should be no space along the wall above the kitchen countertop further than 24” from an outlet receptacle. This basically translates to – “an electrical outlet every 48” above the countertop”. Wall section directly behind the sink, kitchen range, and cook-top doesn’t require electrical outlets. Each individual counterspace 12” or wider requires an electrical outlet receptacle. 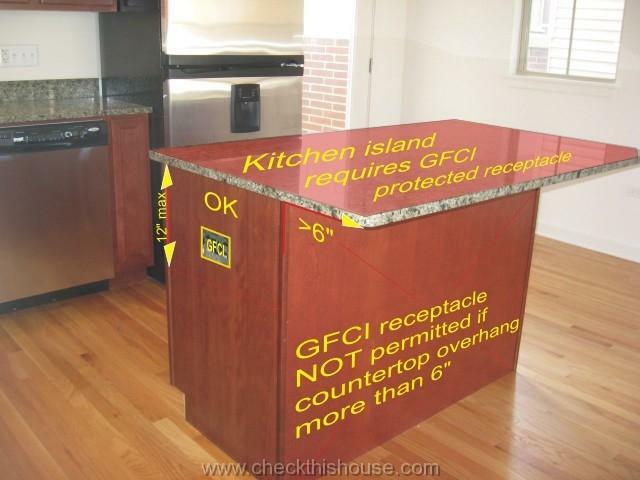 Kitchen island and the peninsula require at least one GFCI protected receptacle (no more than 12” below the counter with up to 6” overhang). The island receptacle is sometimes missing because of the difficulty in installation, especially if the island was not planned in an original layout. If your new kitchen inspection reveals an outlet receptacle missing from the kitchen island (assuming it is required in your jurisdiction), try to look at this problem and all other issues as a person purchasing this house / condo from you in the future. Imagine ripping of the floor, maybe cutting the concrete layer underneath to accommodate conduit, maybe removing some of the kitchen cabinets to connect this single outlet … You’re looking at maybe several hundreds (if not thousands) of dollars spent on something that should be in place. If it’s a brand new kitchen inspection you’re performing, make sure that everything is correct or request repairs from the developer/ contractor. Make sure the exhaust fan / microwave assembly is secured to the wall / cabinet. Turn it ON and check if there’s any suction at the bottom inlet ports (you can place sheet of paper over the inlet). Some installers forget to adjust the unit for recirculation or exterior discharge (knockout plates might need to be removed and / or blower assembly flipped). If there’s no suction, appliance would have to be removed and disassembled to correct this condition. It is also possible that wrong type of the hood has been installed, it might be designed for an exterior discharge only and if such was not provided, it will be blowing air from underneath. Open the cabinet above the hood and check if the exhaust fan discharge pipe is installed and secured. No plastic ducts are permitted and building code requires smooth wall pipe / not a flexible type (by the way, a while ago I had a conversation with a Chicago building inspector who said that flexible is OK, while his book says it is not…). Grease will contaminate flexible air duct much faster and create a fire hazard. 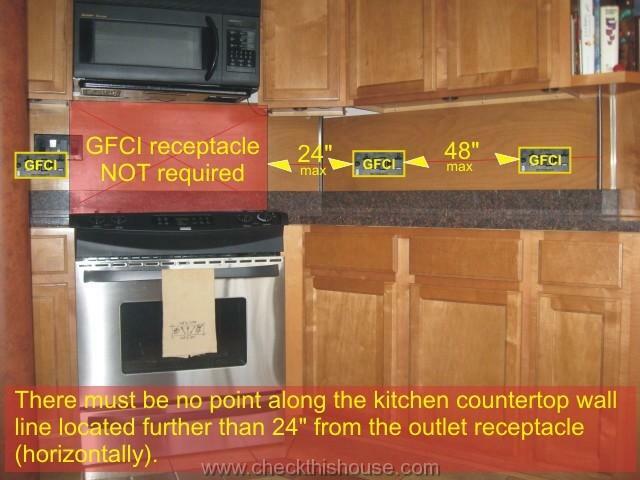 Kitchen cabinet unprotected surface (no hood / microwave installed over the gas range / cook top) must be at least 30” above the gas burners, 24” if range hood installed (or lees if allowed by the vent/microwave manufacturer). Make sure that the dishwasher is secured to the countertop or side cabinets and properly leveled. The door should easily close and its lock engage without forcing it. Run a cycle to ensure that there are no leaks on discharge and supply lines. Examine kitchen floor area in front of the appliance for leakage stains / damage. Kitchen inspection – dishwasher air gap, high loop, anti-siphon – To determine proper installation, you will have to check manufacturer’s installation guide for your particular appliance. Some dishwashers have those features already built in but they are not visible. Run water into the garbage disposer side sink, turn the switch ON to operate disposer. Check sink and drain pipe connection for leaks. Examine electrical connection at the bottom or side of the disposer and at the junction box (if present) – there should be no loose connection or / and exposed wiring. Gas appliances require shutoff valve immediately after the flexible gas connector – shine a flashlight behind the appliance without moving it, or move it as little as possible. If the kitchen range gas shutoff valve is located at the wall lower section, it might be visible by removing the bottom drawer. Kitchen range must have a safety anti tip bracket installed (chain will do too) to prevent it from tipping over and injuring whoever accidentally pushed down onto the open oven door (manufacturer requirement, always included in installation kit, rarely installed). Test faucet assembly to make sure that it is secured and free of leaks, make sure that cold and hot is where it supposed to be. Run water in each sink bowl for several minutes and check for leaks underneath the sink. Check if countertop / its backsplash are secured and sealed with silicon at seam and along the wall to prevent water penetration. Look for dents, chipped edges, uneven seams, cracked surface. Stone and tiled countertops require sealer application on regular bases (depending on material and sealer). However, there’s no such obligation, so protect your investment on your own – application of a good sealer will preserve the surface original look, prevent staining of natural stone and grouted areas (if tiled). Kitchen inspection tip: In case you have a marble countertop or backsplash, be extremely careful with anything that might cause discoloration – marble is like a stain sponge – seal it often and with good products. Test cabinet doors and drawers for alignment and proper operation – they are usually very easy to adjust with a screwdriver (as long as the hardware is not damaged). The cabinets must be secured to the wall framing and in most cases you’ll be able to see screw heads along the interior or exterior top and base of the cabinet. However, some kitchen cabinet manufacturers use special system of railings which is attached to the wall framing and the cabinet simply hangs on it. In such case there might be no visible screw heads. Also, look for scratches, cracks, warped doors, exposed nails, loose / missing kick-plate, and anything else that doesn’t look natural. Operate light switches to make sure that all fixtures are functional. In some floor plans you might have two kitchen entrances and light switches located at each one. You should be able to turn the lights ON/OFF (at least the main light fixture) independently from each side. Test both switches in ON and OFF position – if improperly wired or wrong type of a switch used, you will not have a full control at both ends. There are two types of light fixtures used for this purpose – low voltage (usually 12V) and a regular / high voltage. Low voltage wiring between the fixture and a transformer doesn’t have to be inside the conduit (some jurisdictions might require it) and it should never be mixed with high voltage wires. The transformer could be inside the kitchen cabinet, on top of it, or underneath / behind the kick-plate, usually plugged into an electrical outlet / sometimes switched. Low voltage wires can pass through the cabinet walls and behind them to the fixtures itself. There are also (sometimes looking exactly like low voltage lights) under the cabinet lights that require high voltage power supply to the fixture itself (transformer might be built into the light fixture), and in such case that wiring between the electrical box / switch must be inside the conduit with a proper type connectors installed. If the light fixture came with a cord & plug (not designed for hard wiring), this must not be altered, lamp cord removed or hidden behind / inside the walls. Light fixture should have a label stating what kind of a voltage is using – it’s usually visible on the fixture enclosure surface or after you remove the light bulb cover (turn the light OFF and don’t touch the light bulb if halogen). I hope you didn’t find to many problems during your kitchen inspection.